Survey map from the LADWP archives, courtesy of St. Francis Dam researcher Ann Stansell (2013), shows the ownership of properties in San Francisquito Canyon that were damaged by the floodwaters when the dam broke in March 1928. 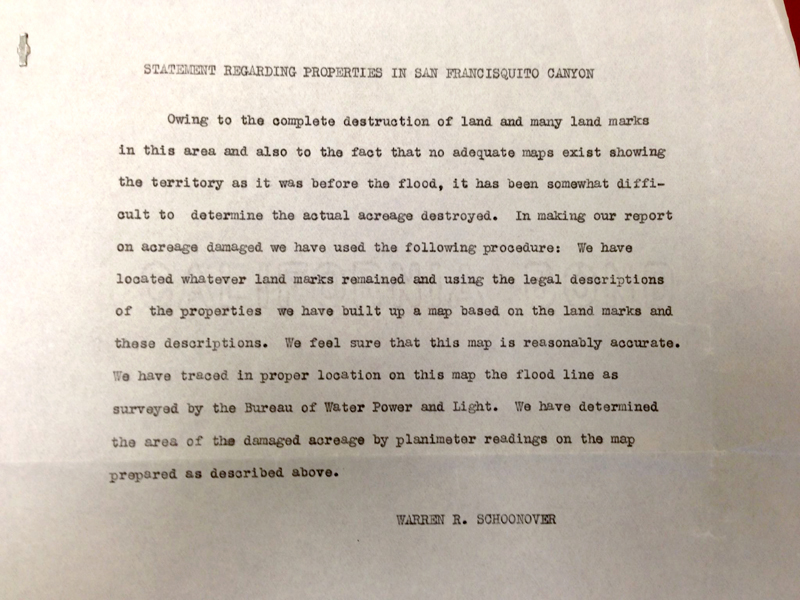 The map was prepared by W.R. Schoonover (in charge) of the Agricultural Extension Service of the University of California and the U.S. Department of Agriculture. The narrative in the upper left-hand corner (reproduced below) indicates this was the first time the properties were mapped. Owing to the complete destruction of land and many land marks in this area and also to the fact that no adequate maps exist showing the territory as it was before the flood, it has been somewhat difficult to determine the actual acreage destroyed. In making our report on acreage damaged we have used the following procedure: We have located whatever land marks remained and using legal descriptions of the properties we have built up a map based on the land marks and these descriptions. We feel sure that this map is reasonably accurate. We have traced in proper location on this map the flood line as surveyed by the Bureau of Water and Power and Light. We have determined the area of the damaged acreage by planimeter readings on the map prepared as described above. AS2802a: 19200 dpi jpeg compiled from two jpegs.